Have you ever been the outsider looking in? A place or time where everyone knew what to do or how to participate accept you. Perhaps you felt uncertain or uncomfortable with not fitting into what was happening. Or you might have been concerned about making a mistake or being seen as disrespectful. We each have experienced that desire to be part of what is unfolding before us, yet we can’t for whatever reason ever really be an insider. 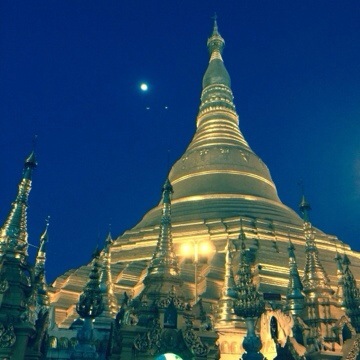 I experienced this last night as my fellow travelers and I from Central Baptist Theological Seminary made a pilgrimage to Shwe Dagon Pagoda in Yangon, Myanmar. (formerly Burma) The sun was just setting when we arrived and the afternoon heat dissipated quickly to create a cool, breezy evening for us to take in this enormous holy Buddhist site. The Shwe Dagon Pagoda has been here in Yangon for nearly two-thousand years. It is a sacred, thin place where the Buddhist people can connect with Buddha individually and also collectively. We saw hundreds, if not a thousands of people of all ages praying, giving offerings of water and money and spending quiet time gathered together while facing the pagoda. Even though we see those main concepts of praying, giving offerings and spending time together in Christian churches in America, it was amazing to see the dedication of the people who gathered. The dedication not only to Buddha, but each other. Families came together holding hands, linking arms when walking and sitting together. In America, we lose sight of how we can be more connected to others simply by touching. Instead, we worry about who is invading our personal space or who is touching too much. These people we observed extended themselves naturally to one another and you could feel the connection. They didn’t come to the pagoda for a worship service that everyone sat and listened to on a Sunday morning. It was a sharing of space where believers were cultivating their own worship and prayer. No one was walked through an order of worship and there was no timeframe for the worship to end collectively. Over the loud speaker, a monk was reading the works of Buddha while the people prayed, practiced their water or money offering and they shared space with one another. No one lead them, but themselves, which makes me wonder about how we feel lead to compare services and worship styles in America as it is more for entertaining us in the right space instead of individually being responsible for space we come to worship to pray, give offerings and share connection with other believers. My experience has opened my eyes to new ways of practicing my individual faith and has created a desire in me to revel in not just Sunday morning worship being offered to me, but me being an offering when I worship at all times. The challenge is to find a way to live into a thin, sacred space with God every day and not just weekly at a service, where I expect to be served instead of me only serving God. I will be forever grateful for my time in Yangon and the chance to be on the outside observing an ancient world religion in it’s own setting and context.